If you’re like me, you probably get a kick out of asking Alexa to tell jokes, play music and set alarms. Yelling out “Hey Alexa, play Hits Radio” will never get old for me. I’m fascinated by Alexa and the potential of robots to improve our lives and society. My mind was blown when I recently read that thanks to robots, AI and digitalization, scientists are working on a pacemaker that can upload memories into the brain which would give tremendous hope to Alzheimer’s patients. Have you worried about robots taking your job? New technology is exciting and undoubtedly adds value to our society – but many people worry that humans will become obsolete across multiple job functions and industries. That’s a ton of jobs – nearly the population of New Jersey! Some studies also claim a whopping 50 percent of all U.S. jobs are at risk within the next couple of decades. 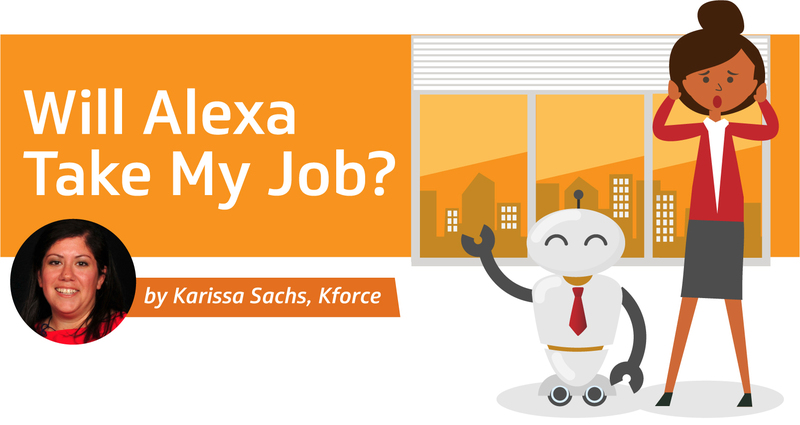 So, let’s address the elephant in the room… Will Alexa take my job? Negatively, by directly displacing workers from tasks they were previously performing. Positively, by increasing the demand for labor in other industries or jobs that arise due to automation. Rewind to the 19th century during the Industrial Revolution, a perfect illustration of Keynes’ theory. As cotton looms were significantly increasing productivity and replacing people, the amount of labor required per yard of cloth declined by 98 percent. However, as cloth became cheaper, the demand skyrocketed and ultimately created four times more jobs in the long run. Throughout history, we see similar examples of this phenomenon; the emergence of e-commerce, the invention of ATM’s, digitalization of newspapers, medical records, etc. There’s no question of AI’s impact on our society. Robots are getting smarter and can do more and more every day; however, they will never be able to replace human beings. Last I checked, getting a bachelor’s in emotional intelligence or a master’s in creativity is simply not an option. Sure, technical reskilling will still be a necessity, but continuously developing the more human-centric skills will be equally important. Take a look at the World Economic Forum’s list of ‘Top 10 skills in 2020’ compared to 2015. Human-centric skills remain in demand. To prevent robots from stealing your job, you need to hit Alexa where it hurts – those human-centric skills that she will never have. Take control over your career and focus on developing soft skills such as creativity, emotional intelligence and cognitive flexibility. These three skills are transferable over multiple professions and withstand the test of time – despite the rise of AI and our ever-evolving tech landscape. How many times have you heard people say, “I’m just not a creative person” or “Creativity is something you’re either born with or born without?" Maybe this even applies to you. If you’re skeptical that creativity is a skill that can be learned, then think again. More importantly, it is imperative that creativity is practiced and integrated into your everyday thinking. One of my favorite business books within arms-length in my office is “Thinkertoys: A Handbook of Business Creativity” by Michael Michalko. I purchased this book about 15 years ago, and I’m amazed at how often I go back to it for inspiration, idea-generating tools and techniques. The author introduces 30 powerful techniques to turn anyone into a startlingly creative thinker. An example is the SCAMPER method, a checklist of idea-spurring questions. This book, among others, is proof that anyone can learn to be a creative thinker, but just like in sports, creativity is a muscle should be exercised daily to get the best results. The Institute for Health and Human Potential defines Emotional Intelligence (EI) as the capacity to recognize, understand and manage your own emotions and the emotions of others. In his book "Emotional Intelligence," psychologist Daniel Goleman lists five key traits that comprise EI: Self-Awareness, Self-Regulation, Motivation, Empathy, and People Skills. What do these traits have in common? They are human-centric and impossible for a robot. Alexa [robots] will never be able to show empathy, have self-awareness or demonstrate motivation. These are all traits that are unique to humans. Because these traits will prevent robots from taking our jobs, we must aim for mastery through continuous practice and implementation. It's tough to rate our emotional intelligence objectively, but I challenge you to do so. Take a look at the following traits that are pulled from Goleman’s “Leadership That Gets Results.” How would you honestly rate yourself in each of these areas? Are there specific goals you can put in place to improve your EI as we move into an AI world? Emotional self-awareness: the ability to read and understand your emotions as well as recognize their impact on work performance, relationships, etc. Adaptability: skill at adjusting to changing situations and overcoming obstacles. Organizational awareness: the ability to read the currents of organizational life, build decision networks and navigate politics. Cognitive Flexibility, according to Mental Health Daily, “refers to the brain’s ability to transition from thinking about one concept to another. The quicker you can switch or shift your thinking from one dimension to another, the greater your level of cognitive flexibility.” This psychological term has become increasingly popular in the business world due to the necessity of this ability as we move into the AI age. No matter how advanced robots become, they will never be human and therefore cannot have cognitive flexibility. Similar to the two other skills we discussed (creativity and emotional intelligence), cognitive flexibility must continuously be practiced. If you ask anyone on my team, they will tell you that I am always talking about the importance of being a strategic thinker and a tactical executer. It’s critical that you’re able to do both to ensure your future career success. This is an excellent example of cognitive flexibility. You can think about it like wearing hats or switching channels on the TV. When you have your “strategic hat,” on, you are leveraging a specific skill set and way of thinking, however, when you switch to your “tactical hat” you are using a different skill set and thinking about things in a completely different way. Being able to transition between multiple projects and concepts as well as looking at problems and deliverables through different lenses will undoubtedly give us a leg up over Alexa. Exercise your cognitive flexibility daily. When you’re presented with a complex problem, break it down into smaller chunks and challenge yourself to figure out how the small pieces are part of the bigger puzzle. Take time to step away from “the day to day” and wear your strategic hat for a little bit. Think high-level, big picture, 20,000 feet up in the air, now go even higher – 30,000 feet. Spend some time at this vantage point. Now, take your strategic hat off, roll up your sleeves and switch to your tactical hat. The problem didn’t change, however, your approach to resolving it did. Advancements in automation and AI are coming at full speed and show no signs of slowing down. Technical reskilling will remain critical in the years to come, but a focus on human-centric, soft-skill mastery will be imperative if we want to keep Alexa away from our desks.